2. 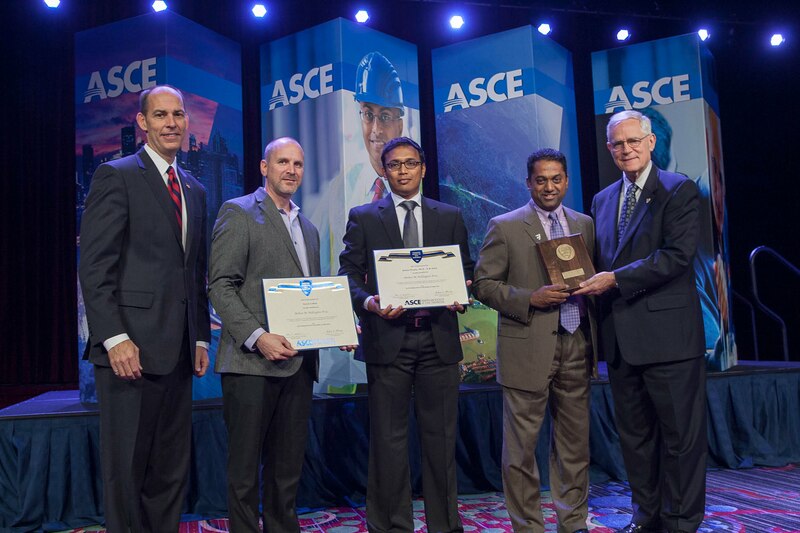 Kalyan Piratla received the national award, 2015 Arthur M. Wellington Prize, from the American Society of Civil Engineers (ASCE) for co-authoring the paper titled "Quantification of a Sustainability Index for Underground Utility Infrastructure Projects," which was published in the ASCE Journal of Construction Engineering and Management in 2013. Left to right: Mr. Thomas W. Smith III (ASCE’s Executive Director), Mr. Aaron Cohen (Sr. Lecturer at ASU, co-recipient of the Wellington Prize), Dr. Kalyan R. Piratla (Asst. Prof. at Clemson), Dr. Samuel T. Ariaratnam (Prof. at ASU, co-recipient of the Wellington Prize), and Dr. Robert D. Stevens (ASCE President). 3. Kalyan Piratla received the best poster award for the paper "Enabling Sustainable Sensing in Adverse Environments" at IEEE SECON 2013 conference held in New Orleans, LA. 4. Kalyan Piratla received international scholarship award from the Association for the Advancement of Cost Engineering in 2011. 5. Kalyan Piratla received Del E. Webb Foundation Fellowship Award in years 2009, 2010 and 2011 at Arizona State University. 6. Kalyan Piratla received Arizona Water Scholarship Award in year 2010. 7. Kalyan Piratla received the ASU Graduate Fellowship Award in 2009. 7. Andrew Hayes, Recipient of NRT Fellowship from Clemson University in 2018.